This year as Monkey boy entered Primary Four I am focusing more on sprucing up his skills in English Composition. 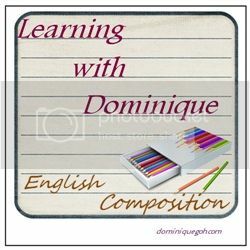 English composition is an area which many students find trouble in. Even though as a component itself it doesn’t bear the majority of marks in the English Semestral Assessment which occurs twice yearly it does affect one’s overall English grade. Before one can put the pencil to paper there are many different things that one needs to consider. 3) The use of content and language. The requirements have changed a lot since entering Primary one. Now in Primary 4 he is required to write a essay is at least 120 words long and has to either describe in detail the pictures given or develop his own story based on the prompt given. Just stating the facts as based on what one sees and brief or minimal expression of ones thoughts or feelings will not suffice at this level. No doubt you may be able to pass this component by doing just that but you would not be able to score good marks. The visual/written cues given in the chosen scenario has to be fully and thoroughly developed into a highly interesting written piece which has to capture and captivate the interest of the reader. The essay which is pen out has to be entertaining and also tug at the marker’s heart string. Besides having an engaging story line the students needs to use appropriate grammar and have minimal spelling mistakes in their essay. If he is able to fulfill these requirements I’m certain that he would be able to score highly in this area. How then does one groom a child to do well in this component? In the next post I will touch on the rubrics on how a composition is marked. Writing is indeed a challenge for children….and adults too! I work as a professional writer and I am still surprised to see how many adults have difficulty with the seemingly simple task of just writing a letter. In terms of grooming children, I think the first step is having them use their imagination to tap into their creativity. If they do that, and write about things they enjoy, it will be less of a task and more fun! I always had difficulty writing in elementary school. I didn’t like writing about forced topics, it is so much easier when you are writing about topics you enjoy or from the heart. I agree that it is best to begin children with basic descriptive compositions about something they enjoy. I hope Monkey Boy hones his skill in writing! This is a helpful overview. My youngest is just starting to write compositions. I’ll have to check back to read your future posts! Great post I will have to check back for more on this topic. The writing skills you are helping your child develop will bless their life forever. Writing is such a beautiful way of expressing how we see life.